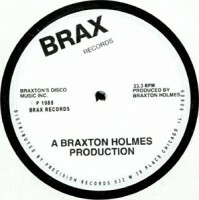 Super limited white label pressing of this Braxton Holmes edit of Patti LaBelle's killer disco track "Get Ready (Looking For Loving)". Released at the turn of the 80s, it features incessant percussion lines twinned beautiful with staccato lead guitar licks and empowered vocals that loop over and over and really get stuck in your head! Anyone with a penchant for dancing and nightlife is bound to have heard this number at some point belting out the speaker stacks; but they may not have heard this amazing extended trip which somehow managed to whip the listener up into a salviating beast, awaiting each successful drop with an even more fervent energy - killer! B/W Braxton's own "Supreme Beats" which distilled the percussive black magic from the track and delivers it to us as a mainline injection. THis fiery and demonic workout should only be reserved for the real late night freaks and delivered with appropriate caution! So good. Patrick says: I'm always up for a bit of Patti LaBelle, but this particular hit ranks alongside "The Spirit's In It" at the top of her tree. Here we get the extended, repeated, groove heavy recut from Braxton Holmes, which flips the OG in the time honoured Ugly / Hardy style. Class. The bounty doesn't end there though as Braxton's included the percussive voodoo of his sick DJ tool "Supreme Beats". These are currently flying off the shelves, and we can't get more, so get on it ASAP.